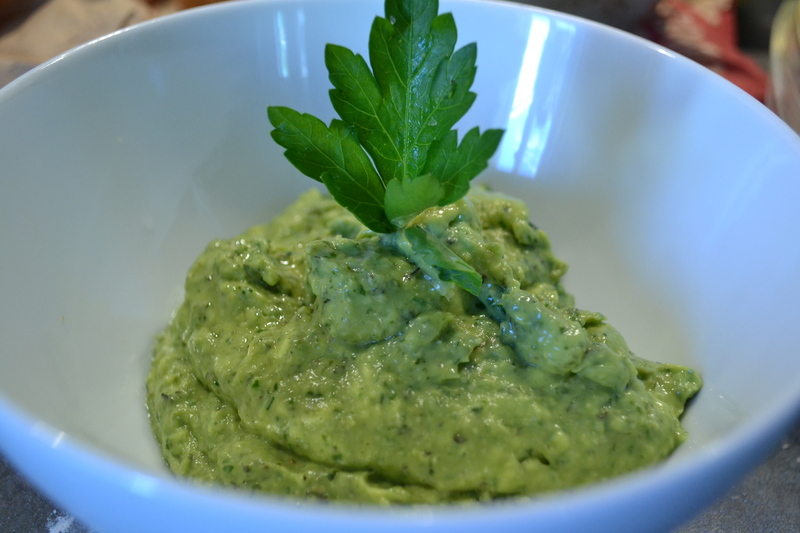 13 Comments on I Love Avocado Pesto! Do you know what I love about avocados? Everything, especially when they’re main ingredient in this recipe. 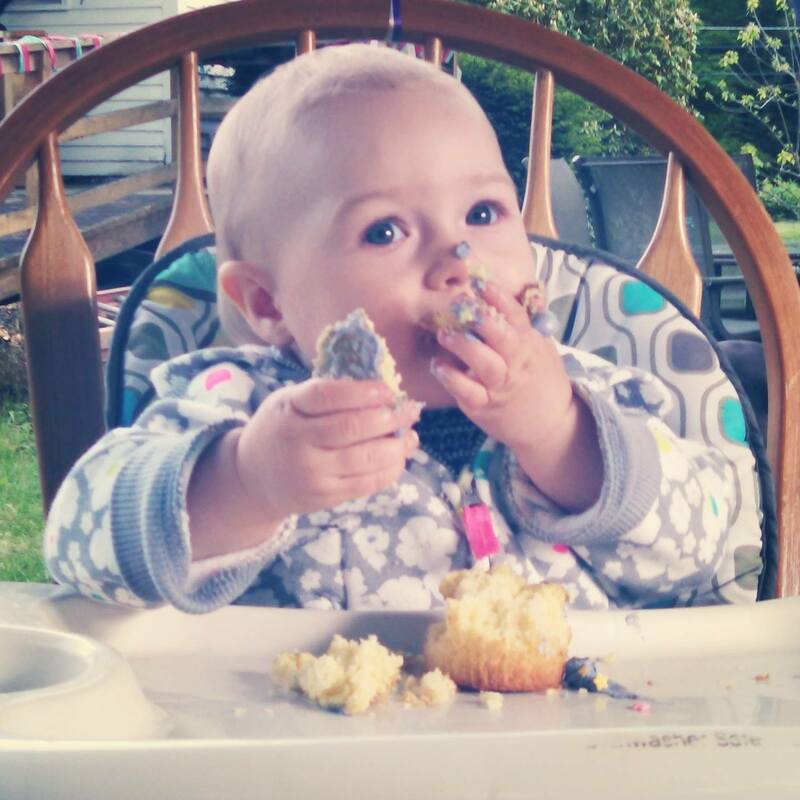 The only thing better than eating an avocado myself is watching my one year old niece devour one. It’s impossible not to laugh as she holds gobs of green pulp quizzically up to her face, before squishing it unceremoniously into – and onto – her pinchable cheeks. Not an avocado, but this exploded-cupcake should give you the basic idea. My cheeks are not nearly as pinchable, but this recipe makes me want to take a page from her book of eating habits, I would be perfectly happy shoveling this pesto into my face by the handful. 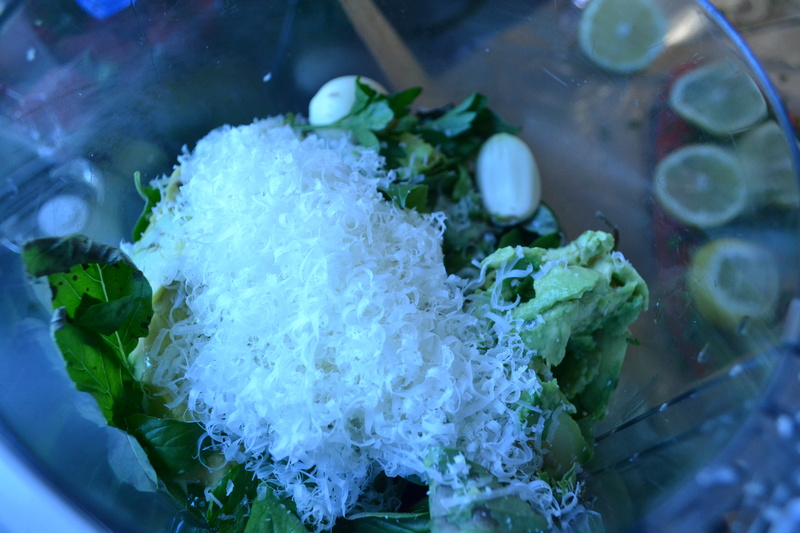 In fact, the first time I whipped up this pesto recipe, it was a major feat of self-restraint to not hoover the contents of the food processor basin. Not kidding, I would have happily licked the spatula clean. This recipe uses a whole avocado in place of the nuts in normal pesto recipes. 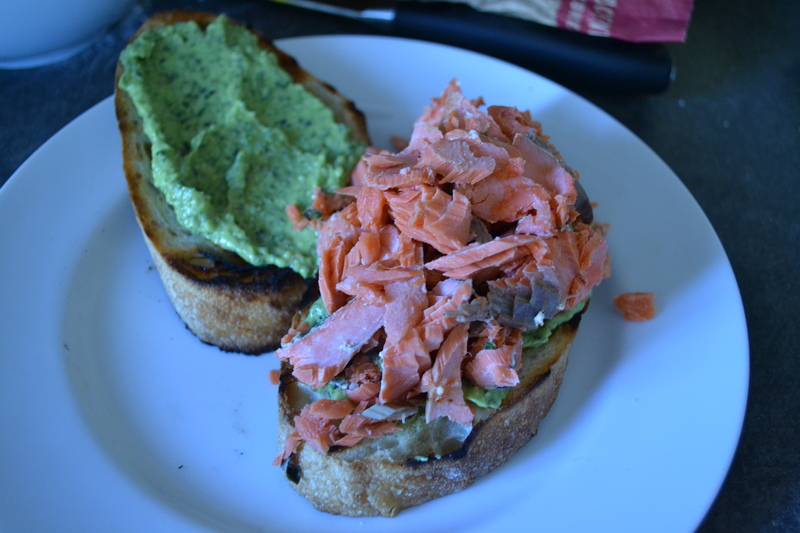 The avocado gives the mixture a smooth, spreadable consistency, almost like frosting, which made it perfect for use on a grilled salmon sandwich (I’ll share this later). Note to self: Use this pesto on BLT’s and Caprese sandwiches. 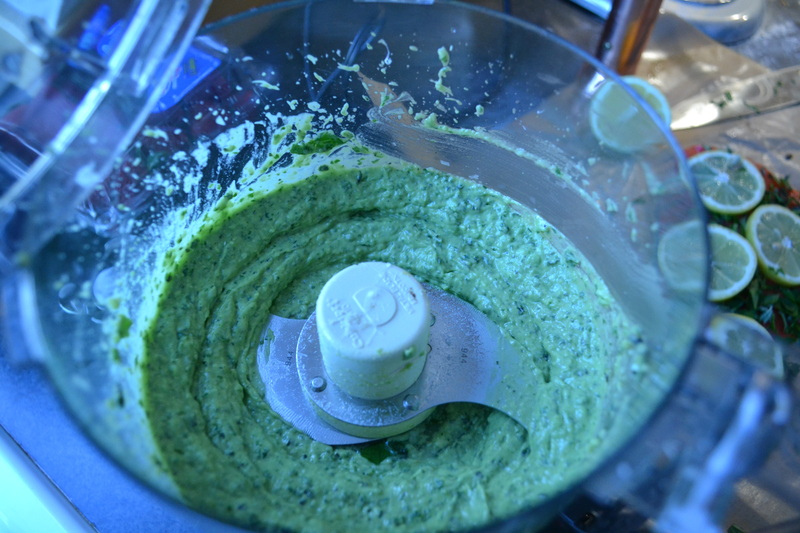 Less avocado, and more olive oil yielded a less viscous mixture – along the line of a more traditional pesto – which went really well with my hand-made roasted garlic and red pepper fettuccine (more on this when I share the pasta recipe). You can choose to leave out the oregano and parsley to give the pesto a more traditional (basil only) flavor, but I found that the mellow sweetness of italian parsley, and the bittersweet zip of the fresh oregano served to playfully punctuate the smooth, complimentary avocado-basil combination. Halve the avocado, remove the pit, and cut/squish the flesh from the skin. The fruit doesn’t have to be perfectly ripe, as it’s destined for a date with the blades of the CuisinArt. If the flesh is less-ripe, you may want to rough-chop it to make it easier to incorporate. Puree the ingredients together in a blender or food processor. You should aim for the herbs to be well-blended and combined into the mixture, while leaving the result relatively creamy and spreadable, like the texture of a thin hummus. Spread the pesto on the desired surface with a spoon, or add it to your favorite pasta dish… that is if you can refrain from eating it all before you serve it! Wow! Will most def try that out! Do so, and let me know how it goes! I want to try this pesto, perhaps with pasta. I shall give you a feedback. Thanks for sharing!!! That would be wonderful! Enjoy! That salmon looks delish. I’m tempted to place my tongue on my screen. Thanks for stopping by! Likewise! Glad it looks good! Brian, I love this and am off to gather my ingredients! Great idea. Just make sure to cut back on the avocado a little if you’re going to use it with pasta – otherwise it’s just a little too thick. I love avocados too. One of my favorite things is Avocat Vinaigrette (to use the French name). You simply cut an avocado in half, remove the pit, and put an avocado half (including skin) on a serving plate and fill the well with vinaigrette dressing. Yummy and simple. A humorous note: “avocat” in French means both avocado and lawyer. Must be a great joke in there somewhere. I love pestos — I play with ingredients all the time! I made this one last night — and fooled with it as I always do — but Brian’s recipe is so good, here it is intact! Ours went on salmon, happily. Make sure you scroll through his other recipes, as I have, as he is a great recipe-maker! Happy solstice! Thanks! I’m happy that you enjoyed it!